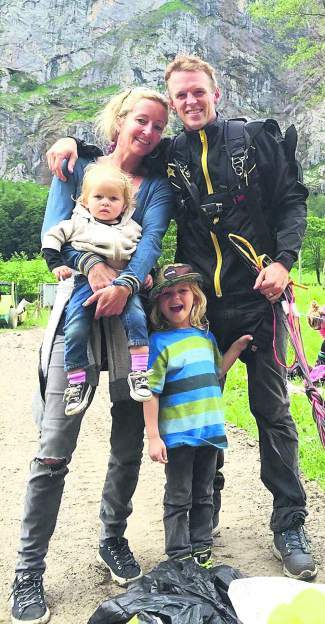 Erik Lars Roner is pictured here recently with his wife, Annika, and two young children, Oskar, 5, and Kasper, 17 months. • Friends and family are working on memorial services for 39-year-old Erik Roner; details will be published as they are made available at SierraSun.com. • In the meantime, a memorial fund has been established. Visit road2recovery.com/cause-view/erik-roner-fallen-hero in order to make a tax-deductible donation to Erik’s wide, Annika, and their children, Kasper and Oskar. 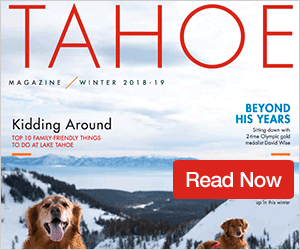 The Sierra Sun spoke Tuesday evening with Nitro Circus founder and Motocross legend Travis Pastrana regarding the tragic death this week of Tahoe City’s Erik Roner. OLYMPIC VALLEY, Calif. — The Squaw Valley and Lake Tahoe action sports communities this week are mourning the loss of another local legend in Erik Roner, a professional skier known for being a family man and helping lay the foundation of what ski BASE jumping has become today. Roner, who grew up in Marin County and lived in Tahoe City and was known in the action sports world as “Rubberneck,” died Monday in a skydiving accident near Squaw Valley ski resort. He was 39. He was part of a four-man jump team of parachuters for the opening ceremonies of the fourth annual Squaw Valley Institute Celebrity Golf Tournament. He struck a tree on his descent at about 9:45 a.m., according to the Placer County Sheriff’s Office, and was entangled high above the ground. Rescuers pronounced Roner dead at the scene after removing him from the tree. The Federal Aviation Administration is investigating the incident. He was the third jumper in the quartet, said witness and family friend Roy Tuscany. Fellow skydivers and Squaw Valley skiers Aaron McGovern and JT Holmes landed safely prior to Roner’s jump, Tuscany said, while Charles Bryant, the fourth jumper, also landed safely. On Monday, Tuscany told Teton Gravity Research — which first reported the news — that he witnessed the accident. 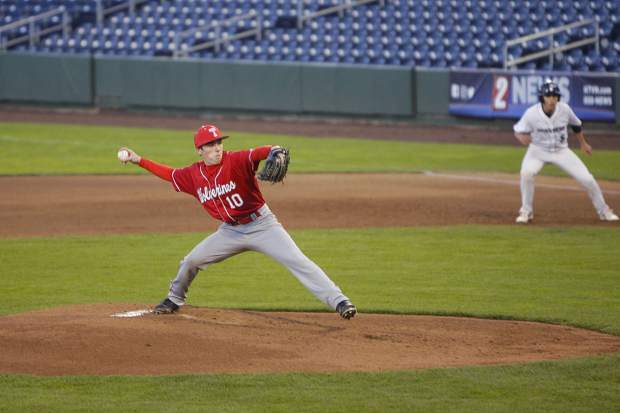 “He hit a tree … he hit a tree so hard. I don’t know what happened from there,” said Tuscany, who is executive director of the Truckee-based nonprofit High Fives Foundation. In his interview later with the Sun, Tuscany spoke candidly about Roner’s life as an action-sports star — he was known across the world for his spectacular stunts, and he filmed progressive big-mountain ski segments with Teton Gravity Research for several films — but more importantly, as a father and husband. According to the Squaw Valley Institute, Roner regularly dedicated his time to SVI’s efforts to present enriching and inspirational programs in order to spark “uncommon conversations and intellectual growth” throughout the Lake Tahoe region. 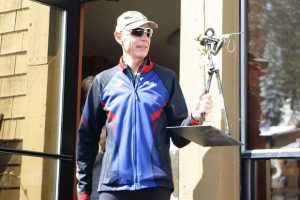 SVI and Squaw Valley | Alpine Meadows were among countless organizations, nonprofits, ski areas and other companies and groups both locally and across the world to issue statements this week expressing profound sorrow over Roner’s death. Likewise, countless Tahoe-bred professional skiers, along with worldwide celebrities and action sports stars, issued statements this week, such as Nitro Circus cast member Parks Bonifay. Others, like actor Johnny Knoxville, founder of the MTV show Jackass and a frequent collaborator with Nitro Circus athletes and producers, took to Twitter to offer simple, yet impactful, statements. “RIP Erik Roner. You will be missed my friend,” Knoxville wrote. According to a biography on his website, erikroner.com, after Roner graduated with a degree in Graphic Design from BYU, he put his efforts toward making a name for himself in the ski industry. Roner was highly regarded as a co-pioneer of ski BASE jumping — along with fellow Squaw Valley skier, the late Shane McConkey, who died in March 2009 following a BASE jumping accident in the Dolomite Mountains in Italy — and he made numerous first descent ski BASE lines from Chile to Argentina to Alaska to New Zealand and all over Europe. In 2005, Motocross legend Travis Pastrana, the leader of Nitro Circus, contacted Roner to help BASE jump dirt bikes into the Grand Canyon, and he eventually joined the extreme stunt-based group of daredevils that enjoyed two seasons on MTV, a sold out live World Tour, and the recent completion of a 3D feature film. “Erik was an amazing person who made everyone and everything around him better,” Pastrana said in a statement Monday on the Nitro Circus website. “His smile, laughter and personality will be missed by everyone at Nitro Circus. Most importantly he has a beautiful wife and amazing kids that will miss him dearly. Roner is immediately survived by his wife, Annika, and two children — son, Oskar, 5, and daughter, Kasper, 17 months. “Erik was a beautiful man, great father, wonderful friend and the love of my life,” Annika Roner reflected in a post Tuesday on the Road2Recovery Foundation, which has set up a tax-free donation fund to assist the family. 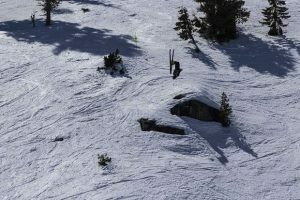 His death is the latest in an unfortunate string of tragedies within the Lake Tahoe and Squaw Valley skiing community. Timy Dutton, a Lake Tahoe native and professional freeskiing master known by many as “Timy Backflips” and “Rubber Ducky,” died last year, also in a skydiving accident, at the Parachute Center in Acampo, Calif., at the Lodi Airport. He was 27. Local skiing and outdoor enthusiasts Kip Garre, 38, and Allison Kreutzen, 41, died together during the spring of 2011 in an avalanche near Lone Pine, Calif. In February 2010, Truckee native CR Johnson, 26, died after a fall while skiing steep terrain at Squaw Valley. Later that year, in June, Squaw Valley freeskier Arne Backstrom, 29, died after falling while skiing Nevado Pisco in the Peruvian Cordillera Blanca. Randall Davis, 21, of Tahoe City was considered a rising skiing star when he died on Christmas Day 2008 in an avalanche at Squaw Valley that also killed longtime ski patroller Andrew Entin. The Squaw Valley-raised McConkey, meanwhile — a U.S. Ski and Snowboard Hall of Famer known as the godfather of ski BASE jumping — was also 39, like Roner, when he died more than six years ago.